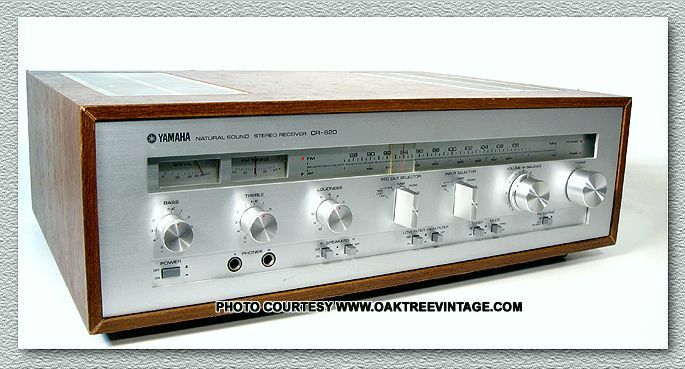 Yamaha Stereo Parts for Vintage Yamaha gear. 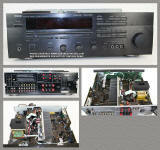 Yamaha Stereo Parts / Spares. Yamaha R-1000 Stereo Receiver replacement battery / batteries parts for cross reference and occasionally for sale. Yamaha A-550 / A550, CA-2010 / CA2010 Integrated Amp / Amplifier, CR-620, CR-240 / CR240, CR-620 / CR620, CR-840 / CR840, CR-1040 / CR1040, CR-2020 / CR2020, R-3 / R3, R-500 / R500, R-700 / R700, R-1000 / R1000, RX-V690 / RXV690 Receiver parts / spares, Yamaha M-80 / M80 Power Amplifier parts, Yamaha K-30 / K30 Cassette Tape deck parts and electronic repair parts / spares again for cross reference and occasionally for sale. on salvage audio & keyboard parts. THIS IS NOT THE SAME PAGE YOU JUST VIEWED. KEEP SCROLLING DOWN. MOST OF THE PARTS LISTED BELOW ARE FROM SALVAGE UNITS. 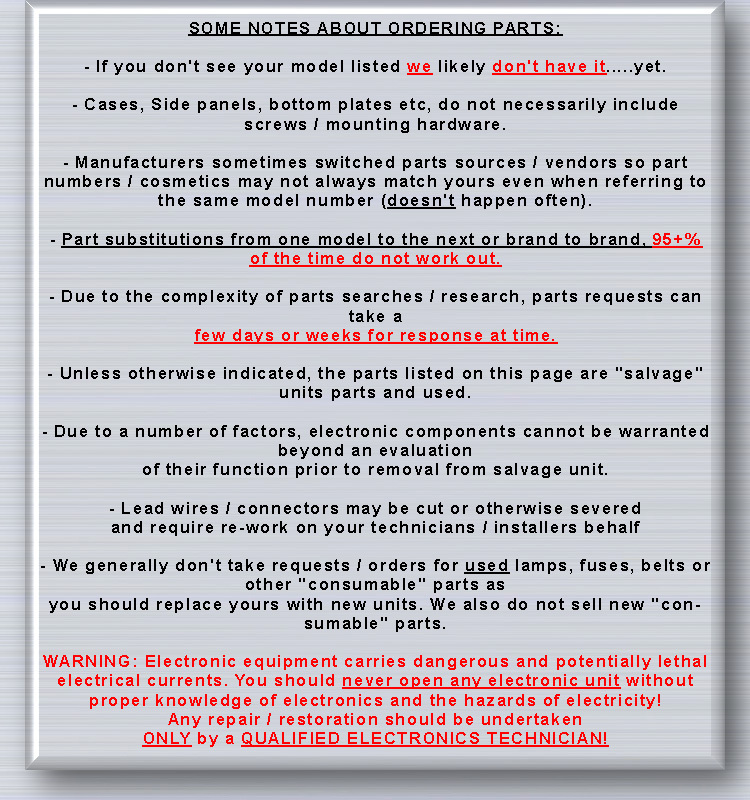 Parts, general condition / circuit board condition; Most of our parts are from 'salvage / donor' units. While we don't sell parts that are 'known' to be bad, occasionally parts will need further adjustment, cleaning, 'tweaking', or in the case of circuit boards, may need old, conductive glue / epoxy further cleaned, and some 'common' parts / components replaced due to 'green / black / furry' legs, or because those parts were marked as 'sold separately'. Panel, Front / Face panel, aluminum, good condition (illuminated selector caps sold separately) - $45. Knobs / Caps / Buttons / Covers �Volume� knob - $30. Knobs / Caps / Buttons / Covers, �Balance�, �Treble�, �Bass� knob- $20. ea. Knobs / Caps / Buttons / Covers, Push Switch / Selector Caps for �Speaker A or B�, �High Filter�, or �Mode� - $15. ea. Potentiometer / Control, �Volume� control pot 10A-200k Ohms x2 on circuit board LC70460-2 - $35. Potentiometer / Control, �Balance� pot M 200k Ohms - $25. Potentiometer / Control, �Bass� pot M30k Ohms B - $25. Potentiometer / Control, �Treble� pot M30k Ohms G - $25. Potentiometer / Control, �Variable Loudness� pot M100k Ohms B - $25. Switch / Selector, �Speaker A�, �Speaker B� Push Switch / Selector - $25. ea. Switch / Selector, �Extensions� plastic, for input Switch / Selector - $20. ea. Switch / Selector, �Power� push Switch / Selector, ALPS SDGIP N 645 with clamping capacitor - $35. Switch / Selector, �Hi�Filter�, �Mode� push Switch / Selector - $20. ea. Switch / Selector, �Tape 1-2�, �Tuner�, �Phono� Push Switch / Selector - $45. all 4 with bracket. Transformer, Power supply Transformer LBEI-85 GA6304 - (US 120 volt version) - $55. Capacitors, Power supply filter caps, Elna 6800mF / 50 Volts - $20. ea. Relay, DEC Type MS4U 12 vdc - $25. Bridge Rectifier, M4C31 7122 - $25. Transistors, �Output� transistors / Power amp transistors; TO-220 NEC 2SD587A, NEC2SB617, SK Replacements SK3934, SK3933 (circuit board, heat sink sold separately)- $20.ea. Circuit Board, �Main� / �Power Supply� / �Tone control�, Circuit Board, Yamaha LC70460-1 with transistors; 2SA798, 2SA999, 2SA1798, 2SB560, Hitachi 2SB690, 2SC1213, Mitsubishi 2SC1384, 2SC2240, 2SC2291, 2SC2320, 2SD726, ECG 2S383, ECG 2S290A, IC horizontal �in line package; M5214L, capacitors RGC5 0.47k, Hitachi voltage regulator 2SD726 and balance of resistors, capacitors and diodes (less tone pots, filter capacitors, bridge rectifier, relay, push Switch / Selector, output transistors) -$65. Circuit Board, �Selector / I/O� circuit board Yamaha LC70190-1, with transistors; 2SA999, 2SC2320, main fuse holder clips, with balance of resistors and capacitors (less fuses, push Switch / Selector, I/O Jacks / Terminals / Connectors) - $45. Circuit Board, �Input indicator� circuit board Yamaha LC70190-2 - $20. Heat Sink, Power amp heat sink (less transistors) - $35. Jacks / Terminals / Connectors, Headphone Jack on Yamaha circuit board LC70460- 4 - $20. 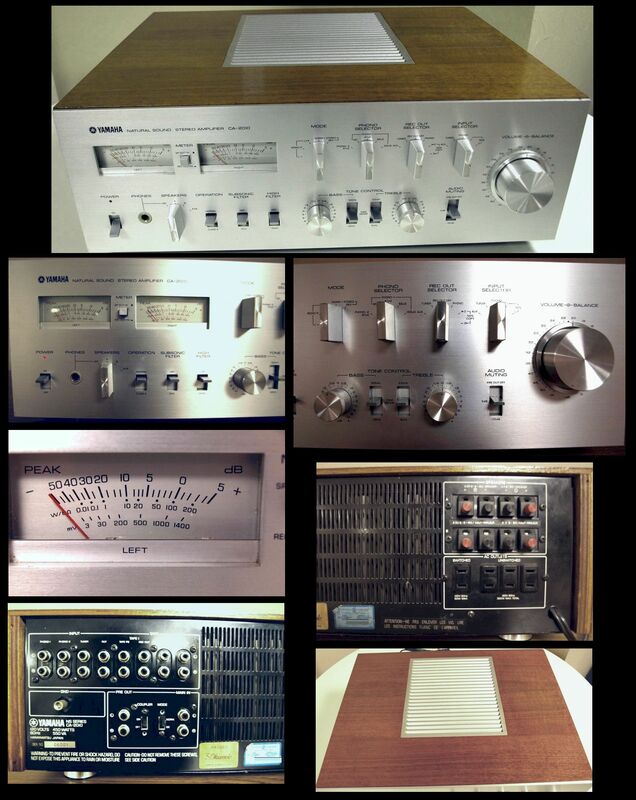 Jacks / Terminals / Connectors, RCA Input/Output, Phono, Tuner, Tape 1, Tape 2 in pairs of �two� - $25. each pair of �two� / 4 RCA Jacks / Terminals / Connectors. Jacks / Terminals / Connectors, �Triple� �Convenience� AC outlet / sockets - $30. Panel, Rear sheet metal panel (less any input / output Jacks / Terminals / Connectors / components) - $25. Call or Email for "SHOWN and NOT marked 'SOLD' " part you need. 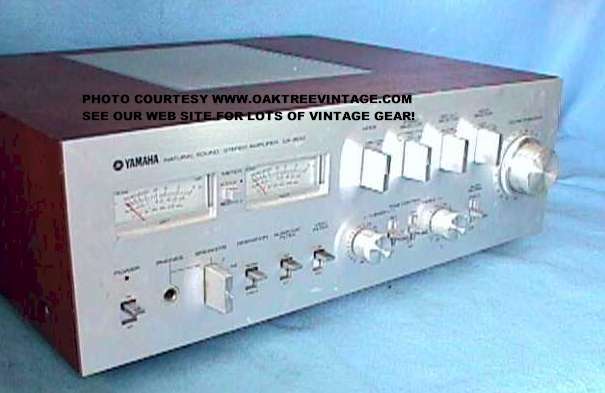 The flagship Yamaha Integrated amp from this time period. Unfortunately this one likely has output problems as the output relay cycles every 2-3 seconds in and out of protect mode. Looks good overall including face, knobs and case. Many of the parts such as Switch / Selector, pots, controls and knobs MAY* also fit the CA-1010 / CA-810 / CA-610 models. Panel, Face plate - $95. SOLD very clean. No gouges, or dings. Knobs / Caps / Buttons / Covers, Balance Ring - $20. Potentiometer / Control, Treble Control ALPS 72B / 300k Ω Ohms x 2 - $45. Potentiometer / Control, Bass Control ALPS 71B / 7.89k Ω Ohms x 2 & 59.2k Ω Ohms x 2 - $45. Switch / Selector, 'Tone Control' 'Tone Defeat' Toggle Switch / Selector - $45.00. ea. Switch / Selector, 'Phono Selector', 'Record Out Selector', 'Input Selector', Switch / Selector front shafts / bushings (not including actual wafer Switch / Selector or extension rods) - $35.00. ea. or $60. for set of 3 on mounting plate. Transformer, Power supply Transformer GA-6092 North American Version - $125. Semiconductor, Bridge Rectifier NTE5342 (not original to amp) - $18. Transistors, Single output original / OEM Transistors (Sanken 2SA745B & 2SC1403B) Tested OK units - $25. ea. Heat Sinks, Black less original / OEM Transistors - $35. ea. Capacitors, Power supply filter capacitors 71V / 22,000μF / uf- $40. ea. Circuit Boards, Yamaha LC67004 Selector / RCA I/O circuit board w/ Yamaha IG-00135 chips (less Switch / Selector, I/O Jacks / Terminals / Connectors, Relay) - $65. Circuit Boards, Yamaha LC66383 Selector circuit board (less Switch / Selector and pots) - $75. SOLD??? Jacks / Terminals / Connectors, Headphone Jack - $30. Jacks / Terminals / Connectors, AC convenience outlets - $20. ea. Unit works, but unfortunately has left outputs going out so we are parting it out. Many of the parts such as Switch / Selector, pots, controls and knobs MAY* also fit other CR-x40 models. Aluminum Face panel (excellent condition) - $45. Large tuning round knob - $30. Paddle knobs - $20. ea. Power Switch / Selector Cap - $18. Power supply Transformer GA6314 - $45. Any single circuit board (less pots, Switch / Selector, large transformers, outputs) - $40. Tuning Capacitor (less plastic string wheel) - $35. Plastic tuning capacitor string wheel - $25. Any pot, Switch / Selector, input / output single panel section - $30. Bottom Plate w/ feet - $25. Jacks / Terminals / Connectors, Any rear panel single component - $25. ea. Jacks / Terminals / Connectors, Speaker output clip sections A or B- $25. ea. some parts MAY* fit the CR-420, CR-820, CR-1020, CR-2020 & CR-2020 as well, but you should investigate PRIOR to contacting us. Face panel with glass (less knobs / buttons) - $55. Dial Pointer, Lamp / Bulb may need to be replaced - $25. Knobs / Caps / Buttons / Covers, Power button / cap - $25. ea. Knobs / Caps / Buttons / Covers, Tuning knob - $30. Knobs / Caps / Buttons / Covers, Balance Ring- $20. Knobs / Caps / Buttons / Covers, Selector 'Paddles' - $30. ea. Potentiometer / Control, Loudness control pot dual 20k Ohms - $25. ea. Switch / Selector, Power Switch / Selector ALPS TV-5 - $35. Switch / Selector, Hi / Low Filter, Stereo / Mono Mode, FM Muting, Tuner AM / FM band selector Switch / Selector - $25. ea. Switch / Selector, Rotary 'Record Out Selector' or 'Input Selector' Switch / Selector - $35. ea. Switch / Selector, Rotary 'Record Out Selector' or 'Input Selector' front panel mechanism - NYLON 'STOPS' ARE BOTH CRACKED! Flywheel, Dial Shaft / Flywheel / Tuning control assembly - $35. String wheel, for tuning capacitor - $25. Transformer, Power supply Transformer GA-6T05 (US 120 volt version) - $55. Jacks / Terminals / Connectors, Headphone Jacks / Terminals / Connectors - $25. ea. 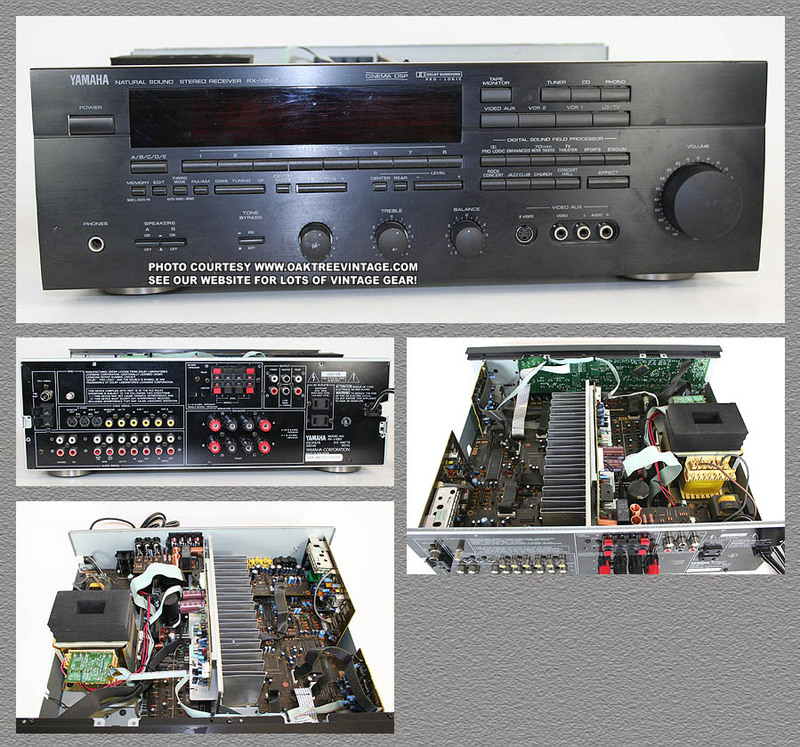 Some parts MAY* also fit other Yamaha CR-X40 models, such as the CR-640, CR-840, CR-1040, CR-2040 & CR-3040 as well, but you should investigate PRIOR to contacting us. Panel, Face panel with glass. Good condition, with only minor wear. Glass perfect. (less knobs / buttons) - $85. Knobs / Caps / Buttons / Covers, Tuning knob w/ set screw - $35. Knobs / Caps / Buttons / Covers, Round Bass, Treble, Presence, Tone / Balance / Loudness knobs - $25. ea. Knobs / Caps / Buttons / Covers, Volume knob. - $30. Knobs / Caps / Buttons / Covers, 'Power' push Switch / Selector cap - $25. Knobs / Caps / Buttons / Covers, 'Low Filter', 'Hi Filter', IF Mode, FM Muting, OTS, Tuner AM/FM, FM Muting 'Push' Switch / Selector caps - $12.50 ea. Switch / Selector, 'Power' Push Switch / Selector. Alps TV-5 type w/ clamping capacitor SDV2P - $35. ea. Switch / Selector, 'Speaker Selector' Rotary Switch / Selector ALPS KA50142 - $45. ea. Switch / Selector, 'RECORD OUT' or 'INPUT SELECTOR' Rotary Switch / Selector ALPS KA500039 - $45. ea. Potentiometer / Control pot, Volume Pot Alps 914N 2x 50kΩ On circuit board LC69700-5 - $45. Potentiometer / Controls, 'Balance' pot 193M, 'center detent' (dual) 2X 20K - $35. ea. Potentiometer / Controls, Bass pot K81M (dual) 2X 20K -$35. ea. Potentiometer / Controls, 'Presence' or 'Treble' pot 193M (dual) 2X 20K - $35. ea. Potentiometer / Controls, Loudness Pot ALPS #192T dual 20k pot - $35. Meters, ''Signal Quality' / 'FM Tuning' VU Meters- $35. ea. Flywheel, Dial Shaft / Flywheel / Tuning control assembly (knob sold separately) - $35. Pulley / String-wheel, plastic string wheel for tuning capacitor - $30. Pointer, Lighted Dial Pointer (will likely need new lamp / bulb) - $20. Linkage, Dial pointer lamp lead linkage - $20. Relays, DEC Relay Type MS4U 12VDC - $35. Circuit Boards, 'Tone Control / Pre-Amp / Power Supply / Protector / Main' Circuit board w/ LC-69670-1. w/ original / OEM Transistors; 2SA1015, 2SC1815, 2SD438, 2SD734, SS-5 / SS-5R Rectifier Diodes (less pots & Switch / Selector, Jacks / Terminals / Connectors, string wheel) - $65. Circuit Boards, 'LED' 'Power indicator' LED on Circuit board - $20. Circuit Boards, 'LED' 'FM status indicator' 6x LEDS on Circuit board - $25. Circuit Boards, Tuning Circuit board 696700-1 / 'AM', 'FM', 'EQ AMP', 'TONE AMP', w/ tuning capacitor. Also includes IC Chips; JRC 8423, NEC UPC577H, Sanyo LA1240, Yamaha IG-02920, A3350 'FM Stereo Decoder' IC, Voltage Regulator 2SD669 and original / OEM Transistors; 2SA1015, 2SC1815, 2SC2240, 2SC461, 2SC535, 2SC2500 (does not include Phono RCA input Jacks / Terminals / Connectors, pots, controls or Switch / Selector. They are available separately) - $85. Transformer, Power supply Transformer GA-6246 - $75. Jacks / Terminals / Connectors, Antenna Input Jacks / Terminals / Connectors / board LC69700-2 - $30. Panel, Rear panel, less all components. Sheet metal only - $30. Switch / Selector, Push Switch / Selector for 'Mode', 'Adaptor', 'IF Mode', 'FM Muting', 'AM / FM' - $25. ea. Switch / Selector, 'RECORD OUT' / 'INPUT SELECTOR' Rotary Switch / Selector ALPS KA500039 - $45. ea. Potentiometer / Controls, 'Presence' or 'Treble' pot 891M - $35. ea. Potentiometer / Controls, Loudness Pot ALPS #893T dual 50k pot - $35. Circuit Boards, 'Tone Control / Pre-Amp / Tuner / Main' Circuit board w/ LC-69660-1. LC69631-6 Circuit boards attached and tuning capacitor attached. 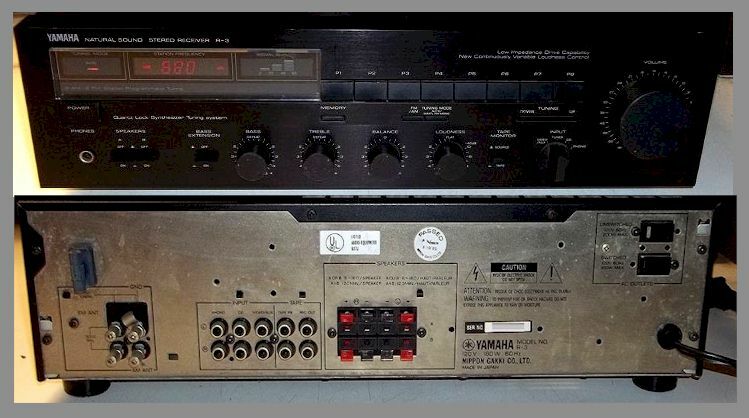 Contains IC chips: SANYO LA1240, Yamaha IG-029320 (Contains Phono Pre-Amp / cartridge, tuner, tone control, equalizer sections) (less pots & Switch / Selector, Jacks / Terminals / Connectors, string wheel) - $65. Capacitors, Power supply filter Caps 63V / 15,000 uf - $30 ea. Jacks / Terminals / Connectors, Antenna Input Jacks / Terminals / Connectors / board LC69660-2 - $30. Panel, Rear panel, less all components. Sheet metal only - $40. Location: PB, South, left 'corner' cab, gray, mid drawer. 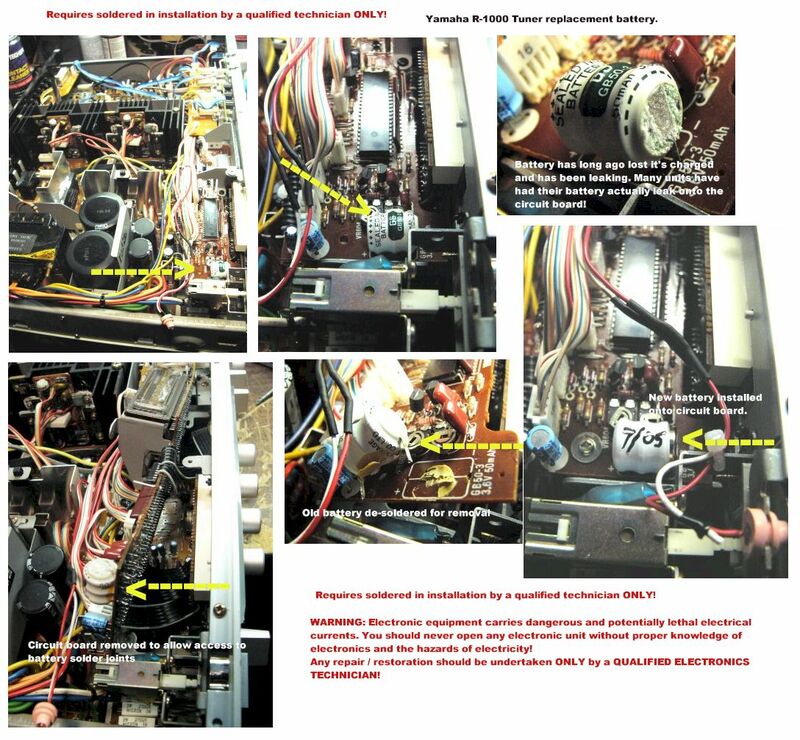 Some parts MAY* also fit other Yamaha CR-X20 models, such as the CR-420, CR-620, CR-820, CR-1020, CR-2020 & CR-3020 as well, but you should investigate PRIOR to contacting us. Knobs / Caps / Buttons / Covers, Tuning knob - $45. Knobs / Caps / Buttons / Covers, Volume knob. 2 minor blems but looks good - $30. Knobs / Caps / Buttons / Covers, Balance 'Ring' knob. - $25. Knobs / Caps / Buttons / Covers, Speakers / Mode / Rec Out Selector / Input Selector Rectangular 'Paddle' knob - $30. ea. Knobs / Caps / Buttons / Covers, Phono cartridge capacitance selector knob - $25. Knobs / Caps / Buttons / Covers, 'Turnover Frequency' / Dolby FM / FM Blend / FM Muting / OTS / Tuner / Audio Muting 'Push' Switch / Selector caps - $12.50 ea. Switch / Selector, 'Speaker' Selector Switch / Selector - $45. ea. Switch / Selector, 'Hi / Low Filter' Toggle Switch / Selector - $30. ea. Switch / Selector, 'Phono cartridge capacitance' rotary Switch / Selector - $35. ea. Switch / Selector, 'FM Muting ON' / FM Muting Level' / 'Dolby FM adaptor' / 'OTS' / 'TUNER' / 'FM Blend' 'PUSH' Switch / Selector (see also CBS 12-pin Switch / Selector) - $25. ea. Switch / Selector, 'AUDIO Muting' on circuit board LC67151-3 (see also CBS 12-pin Switch / Selector) - $25. ea. Switch / Selector, 'METER SELECTOR' on circuit board LC67183-2 - $25. Switch / Selector, 'RECORD OUT' / 'INPUT SELECTOR' / 'MODE' Rotary Switch / Selector - $45. ea. Meters, 'SP OUT' (power) / 'Signal Q' / 'FM Tuning' VU Meter trio - $65. String-wheel, plastic string wheel for tuning capacitor - $30. Relays, Relay Type HC2-P-DC12V - $35. Circuit Boards, 'Tone Control / Pre-Amp / Amplifier' Circuit board w/ LC-67171-1, 2 & 3 Circuit boards attached (less pots & Switch / Selector) - $65. Circuit Boards, Tuning Circuit board / 'Head Amp / Phono-Preamp w/ tuning capacitor. 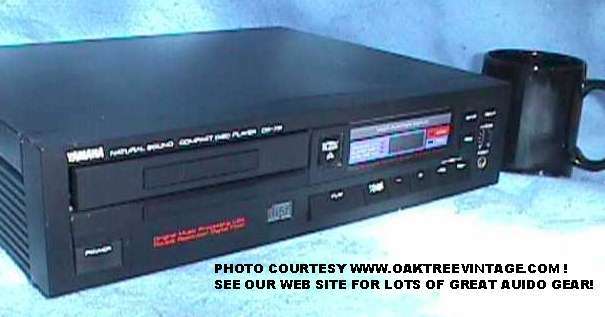 Also includes IC Chips; Sanyo A3350 'FM Stereo Decoder' IC (does not include Phono RCA input Jacks / Terminals / Connectors or cartridge capacitance selector Switch / Selector. They are available separately) - $85. Transformer, Power supply Transformer GA-6108 Secondary's produce; Blue-Blue 16.92VAC, Red-Red 85VAC & Red-Black 42VAC - $95. Capacitors, Power supply filter Caps 70V / 18,000 uf - $40. ea. Jacks / Terminals / Connectors, 'Pre-Out' / Main-In' RCA Input / Output Jacks / Terminals / Connectors w/ coupler Switch / Selector - $35. Jacks / Terminals / Connectors, Antenna Input Jacks / Terminals / Connectors / board - $30. Parted out due to to broken plastic 'structural' parts behind face-plate, broken speaker connectors, and left channel was clipping on the 'tops' pre-maturely. Bonnet / Case / Cover / Cabinet, Black sheet metal (slight scratches on side) (less bonnet attachment screws)- $65. Knobs / Caps / Buttons / Covers, �Speaker� A / B / C, black plastic buttons (less Switch / Selector sold separately) $20. ea. Knobs / Caps / Buttons / Covers, �Power�,� Class A� button / caps (less Switch / Selector sold separately) - $30. ea. Knobs / Caps / Buttons / Covers, �Peak Hold�, �Range�, �Load� (less Switch / Selector sold separately) - $20. ea. Knobs / Caps / Buttons / Covers, �Volume� knobs, black plastic (less Switch / Selector sold separately) - $25. ea. Speaker Switch / Selector / Control, �Speaker�, A / B / C, 3 (three) locking push Switch / Selector on circuit board LC7590-4 (less buttons /caps )- $45. ea. Switch / Selector, �Power� push Switch / Selector, ALPS SDZIP / 125V / 15 amps with clamping capacitor (less button / cap) - $40. Switch / Selector, �Auto Class A�, �latching push Switch / Selector on circuit board #LC7590-5 (less button / cap) - $20. Switch / Selector, �Voltage Selector� - $35. Transformer, Power supply Transformer GA6786 / 2 /JK03D / SMD (wire colors; Orange/Yellow/Gray/Purple-Brown/White-Red/Red/Orange/Black/Orange) - (�World� voltage version) - $55. Transformer, Power supply Transformer GA6787 / 2 /JK13C / SMD (wire colors; Red/Blue/White-White/Brown-Blue/Yellow/Blue Yellow)- (�World� voltage version) - $55. Capacitors, �Power supply filter caps�, audio grade Nichicon, 45Volts / 47000uf - $35. ea. Capacitors, �Electrolytic capacitors�, Nichicon 100V / 1000uf (less circuit board) - $25. ea. Relay, Matsushita JC2aD-DC24V / AR39109 / 7A250VAC / 50128L- $35. Relay, DEC type MS4U, 24VDC / 451 - $25. ea. Bridge Rectifiers, D5FB20 / 46 (2) with heat sink (less circuit board sold separately) - $25. ea. Bridge Rectifiers, T4D4B414k2 (2) (less circuit board sold separately) - $20. ea. Transistors, �Output� transistors / Power amp transistors; - $25. ea. Transistors, transistors; Mitsubishi 2SC1953 - $15. ea. Circuit Board, Display with �Power�, �Protection�, �Auto A�, Yamaha #LC7590-5 LED and transistor: Mitsubishi 2SC2634 - $35. Circuit Board, �Protection / fuse� circuit board Yamaha # LC7588-2(less fuses) - $20. Heat Sink, Power amp aluminum �heat sink� (less transistors, circuit board) - $45. ea. Fasteners / Bolts, Heat Sink mounting bolts - $8. ea. Jacks / Terminals / Connectors, RCA �Input�, on circuit board #LC7590-7 single pair 24k Gold plated - $25. Jacks / Terminals / Connectors, Speaker Binding post knobs / caps (red or Black threaded plastic caps for speaker wire) - $18. ea. Jacks / Terminals / Connectors, �Convenience� AC outlet / socket - $20. 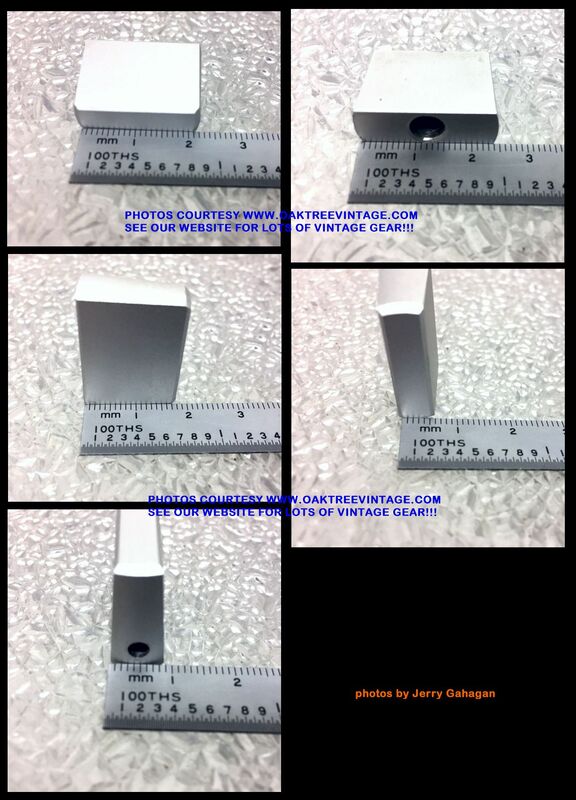 Panel, �Rear� sheet metal panel. black (less input / output Jacks / Terminals / Connectors / connectors, voltage selector sold separately) - $25. Panel, �Bottom� black sheet metal, some corrosion / discoloration - $20. Location: PB, South, 2nd cab from left, Pink, 4th drawer. Some parts MAY* also fit other Yamaha "R" models, such as the Yamaha R-3, R-5, R-7, R-9 as well, but you should investigate PRIOR to contacting us. Panel, Front Face Plate / panel, Black aluminum w/ silk screening, minor edge scratches - $35. Knobs / Caps / Buttons / Covers, �Tape monitor�, �Bass Extension�, �Speaker� buttons / caps - $12. Potentiometer / Control, �Volume� control pot 513P 100KAX2 - $35. ea. Switch / Selector, �Tape Monitor� or �Bass Extension� Switch / Selector - $20. ea. Switch / Selector, �Power� Switch / Selector SDL 1P 4A/32A 250V, on circuit board LC7688-8 with clamping capacitor & fuse holder - $30. Transformer, Power supply Transformer #GA6880 TKP0228-169 - $45. Transistors, Output / power amp transistors (replacements?) SK 2SA1102 and / or SK 2SC2577 - $15. ea. Heat Sink, Power amp heat sink (less transistors) - $25. Circuit Board, Main �Everything� Circuit Board #LC7688-1 including Tuning section PA00081 / 5C11251A, & Transistors; 11549F, 6034XF, 8560 E-4K, 2SA970, 2SC2240, 2SC2250, 4034XF, 2SD438, K246 Y 50, IC Chips; Sanyo LA1235 5C5, LA1245 5C2, 5B3 LA3400, LC7030 680 4L2, LM7000 4L5, JRC 4017, & Resistors; 0.22 Ohms etc., Bridge Rectifier T3D5.C and balance of resistors, capacitors, diodes etc. (relay, Switch / Selector, potentiometers, Connectors sold separately) - $55. Circuit Board, Switch / Selector Circuit Board #LC7688-3, integrated contact buttons for radio presets 1-8, Memory, FM-AM, Tuning mode, Tuning - $35. Circuit Board, Display / Readout Circuit Board #LC7688-2, w/ Digital LED display 512D, Green and Red LEDS, IC�s / Chips; BA618 412 788, & Sanyo LB1274 and balance of components - $35. Relay, Matsushita Relay JR2AD-DC24V / AJR39016 2A 125V AC, 30V DC - $30. Jacks / Terminals / Connectors / Connectors, Convenience outlets, As pair - $20. Jack, Headphone Jack - $20. Jack / Connector / Terminals, RCA Input / Output connectors / Jacks / Terminals / Connectors, �Input�, �Tape�, �Antenna�, ��Ground�, �Speakers�, all as one entire panel - $45. Some parts MAY* also fit other Yamaha "R" models, such as the Yamaha R-500, R-700, R-900, R-1000 as well, but you should investigate PRIOR to contacting us. Panel, Front / Face panel / aluminum w/ dial lens / glass / window, good condition (less tuning scale, glass tuning cover, LED signal quality meter, LED station lock indicator) - $35. Panel, �Tuning scale� plastic, (with glass tuning cover, LED signal quality meter, LED station lock indicator) - $35. Panel, �Wheel assembly� tuning indicator support bracket #320000CB601910 - $25. Meter, �Signal Quality Meter� LED - $30. Pointer / indicator, Tuning �Dial Pointer� #320000AA606610- $25. Knob / Flywheel, Tuning� flywheel #320000NB098040- $25. Knobs / Caps / Buttons / Covers, �Tuning� knob silver #320000BA080160 � $30. Knobs / Caps / Buttons / Covers; �Volume�, �Balance�, �Bass�, �Treble�, �Loudness� knobs silver #320000BA080140 (see also Yamaha R-500, R-700) � $25. ea. Knobs / Caps / Buttons / Covers, �Speakers�, Mode�. �Tuner�, �FM-AM / FM Muting� caps � $20. ea. Knobs / Caps / Buttons / Covers, �Power� Switch / Selector cap - $30. Potentiometer / Control, �Volume� control pot #420000Fi171470 / 100KAX102(less circuit board) - $35. Potentiometer / Control, �Balance� control pot #420000HS310890 / 250K M-N (less circuit board) - $30. Potentiometer / Control, �Loudness� control pot #420000Fi174100 / 150KBX2 (less circuit board)- $30. Switch / Selector, �REC OUT� rotary Switch / Selector #42000KA501620 / ALPS KA50152 45 K (less circuit board) - $30. Switch / Selector, �INPUT� rotary Switch / Selector #420000KA151610 / ALPS KA50161 044 K (less circuit board) - $30. Switch / Selector, �Speaker� push Switch / Selector #420000iF000040 (less circuit board) - $30. Switch / Selector, �Stereo / Mono� push Switch / Selector #420000UW837100 (less circuit board) - $25. Switch / Selector, �Tuner�, �FM Muting / S. Lock� push Switch / Selector #420000Fi174100 (less circuit board) - $25. Switch / Selector, �Power� push Switch / Selector with clamping capacitor Alps TV-5 SDVIP (less button / cap) � $30. Capacitor, �Tuning capacitor�, 5-gang 420000PA000580 / PA00588044 (less string tuning wheel) - $45. Circuit Board, �Main� circuit board #NA075950 w/ transistors; 2SA999, 2SC2240, 2SC2320, Matsushita JC2aD-D24V and balance of resistors, capacitors and diodes, (less stereo power transistor 2STK2040, bridge rectifier T4D4B41012, IC45600, capacitors, heat sink, control pots, Switch / Selector, headphone jack sold separately) - $65. Circuit Board, �Tuning� circuit board, with transistors; 2SA999, 2SC2320, Hitachi IC K3LA1240 Hitachi K4LA3380, Yamaha IG-03210, horizontal package IC M5214L, BA6104, and balance of resistors, diodes and capacitors (less control pots, Switch / Selector, tuning capacitor, Jacks / Terminals / Connectors, plugs and terminals) - $55. Transformer, Power supply Transformer GA6405 - $45. Capacitors, �Power supply filter caps� Elna 8200μF 50 Volts - $25. Heat Sink, Power amp heat sink #BA080260 (less transistors) - $25. String Wheel, Plastic String Tuning Wheel- $20. Jacks / Terminals / Connectors, �Stereophones� / headphone jack, � inch (less circuit board)- $25. Jacks / Terminals / Connectors, RCA Input / Output connectors / Jacks / Terminals / Connectors �Phono�, �Aux�, �Tape 1�, �Tape 2�, in pairs - $30. each pair. Jacks / Terminals / Connectors, Speaker connectors / terminals, 1 bank of 2 pairs, on phenolic resin / fiber board - $35. complete bank. Jacks / Terminals / Connectors, �Antenna� Connectors / post / terminals includes 75 ohm input on fiber board as set of 5 - $25. Jacks / Terminals / Connectors, �AC Convenience outlet / Socket�- $18. Antenna, AM �Stick� swivel / mounting bracket - $20. Panel, Bottom sheet metal - $20. Foot / Feet, - set of 4 - $20. Panel, Front / Face panel / aluminum w/ dial lens / glass / window, w/ all 'push buttons' still attached. good condition - $55. Panel, Plastic bezel, w/ 'Green' lens for digital readout - $25. Meter / Display, 'RX MODE', 'FM STEREO', 'STATION LOCK', �Signal Quality Meter� LED LS-011, on circuit board - $30. Knobs / Caps / Buttons / Covers; �Volume� knob, silver, #320000BA080780 aka #320000BA080360 (see also Yamaha R-700, R-900) � $35. Knobs / Caps / Buttons / Covers; �Balance�, �Bass�, �Treble�, �Loudness� knobs silver #320000BA080140 (see also Yamaha R-500, R-700) � $25. ea. Knobs / Caps / Buttons / Covers. 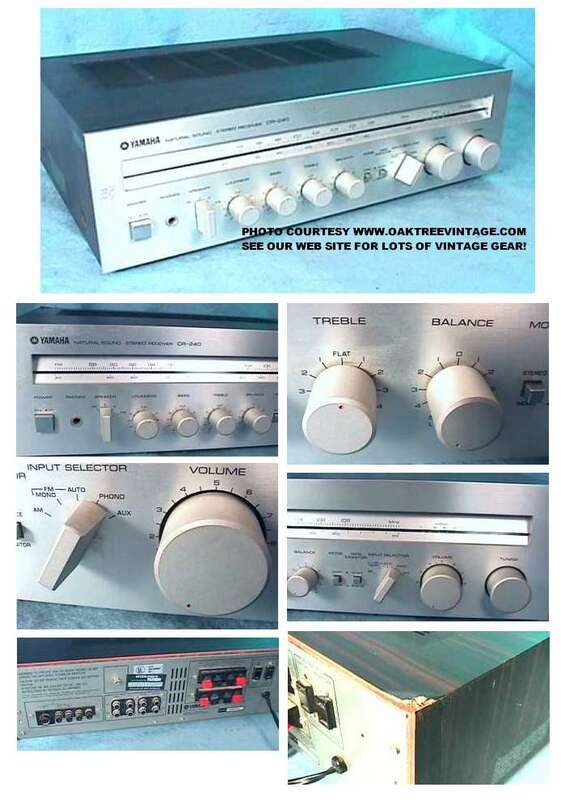 �Record Out�, �Input Selector� 'paddle' knobs, silver #320000BA079460 (see also; Yamaha A-550, A-560, R-500, R-700, R-900, R-1000 and likely many others) - $30. ea. Potentiometer / Control, �Volume� control pot, 60k Ohms, on small circuit board GCMK-77X - $35. Potentiometer / Control, �Balance� control pot, 10K - $30. Potentiometer / Control, �Bass� control pot 20KX2 - $30. Potentiometer / Control, �Treble� control pot - $30. Potentiometer / Control, �Spatial Expander� control pot 10k - $30. Potentiometer / Control, �Loudness� control pot 20K X2 - $30. Switch / Selector, �REC OUT� rotary Switch / Selector, 32-pins - $40. Switch / Selector, �INPUT� rotary Switch / Selector, 32-pins - $40. Switch / Selector, �High Filter� push Switch / Selector w/ nylon push rod - $25. Switch / Selector, �Stereo / Mono� push Switch / Selector, with nylon extension rod - $25. Switch / Selector, �Tuner�, �FM Muting� push Switch / Selector, with nylon extension rod - $25. Switch / Selector, �Power� push Switch / Selector with clamping / surge / 'in-rush' capacitor Noble 'Snap-switch' TV-5 (less button / cap) � $30. Circuit Board, �Main� circuit board #LC72140-1 / NAO763 w/ power supply section, power amp section, and 'pre-amp' section, w/ transistors; 2SA999, 2SC2240, 2SC945, 2SC2320, SK 2SC1983, 2SD613, Transformer 28P002 / GA6435, Matsushita JC2aD-D24V, RB40 Bridge Rectifier, (less stereo power transistor STK1050-II, IG 04540, Filter capacitors, heat sink, control pots, Relay, Switch / Selector, headphone jack sold separately), but with balance of resistors, capacitors, chokes and diodes. - $65. Circuit Board, �Tuning� circuit board LC7290-1 with Tuning capacitor (digital version) PA00055 / 8139 transistors; 2SA999, 2SC2240, 2SC2320, IC Chips; Yamaha IG-03210, Toshiba TC4069UBP, JRC 4558DY, Sanyo LA3380 (Original OEM units. NOT Chinese 'knock-offs' / counter-fits) horizontal package IC M5214L, and balance of resistors, diodes and capacitors (less control pots, Switch / Selector, tuning capacitor, RCA Jacks / Terminals / Connectors, plugs and Antenna posts / terminals) - $65. Circuit Board, Tuner Function / Switch circuit board, LC72190-4 with 10x 'membrane / touch' switches, LED's and diodes. - $45. Circuit Board, Station / tuner readout circuit board, LC72190-3 with fluorescent display tube with IC Chips; Sanyo LC7207 and LC7258 w/ transistors; 2SC2320, and balance of capacitors, diodes, transistors, and pc mounted 'trim' pots - $55. Transformer, Power supply Transformer GA6424 - $45. Capacitors, �Power supply filter caps� 10,000μF 56 Volts - $25. 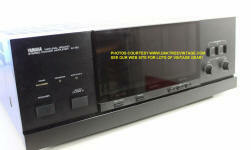 Transistors, �Output� Power Packs; STK1050-II (less heat sink) - $35. ea. Original 'Sanyo' OEM units. NOT Chinese 'knock-offs' / counter-fits. Will be re-tested prior to shipping. Jacks / Terminals / Connectors, Speaker connectors / terminals, bank of 2 pairs, on phenolic resin / fiber board - $35. complete bank / unit. Cord / Lead, AC cord / cable / Mains Lead w/ grommet - $20. 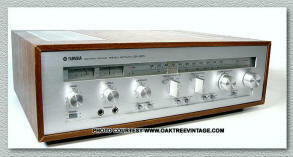 If, like most Yamaha R-1000's, your stereo receiver is having tuner problems, you likely need to change the old battery. Besides visible leakage, battery issues will cause erratic tuning, memory drops, signal drop outs, difficulty in finding stations or settling on a station. These batteries originally had a useful life of approximately 7 years These units were originally marketed in 1981-83 making them over 20 years old! On the off chance your battery still has any residual charge left in it, it is definitely "running on vapors" and will soon fail completely It likely is already leaky, which will cause further damage to the internal circuit boards. We have these batteries custom made for the operation of Yamaha R-1000 Stereo Receiver FM tuner circuit. Requires soldered in installation by a qualified technician ONLY! WARNING: Electronic equipment carries dangerous and potentially lethal electrical currents. You should never open any electronic unit without proper knowledge of electronics and the hazards of electricity! 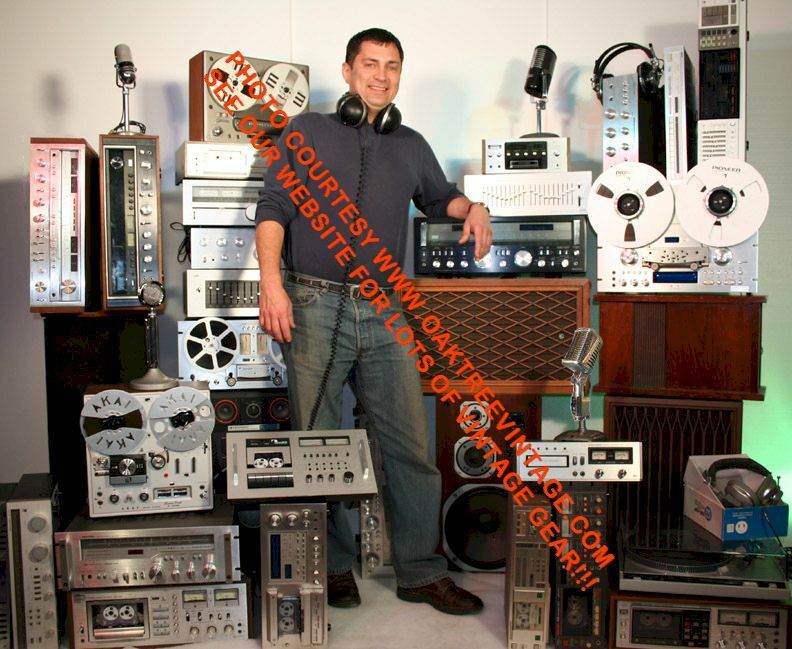 Any repair / restoration should be undertaken ONLY by a QUALIFIED ELECTRONICS TECHNICIAN! The above photo essay is only to illustrate the difficulty of the task, and not in any way meant to be "do it yourself" instructions!!!!!! Unit works, but the tuner sound will periodically disappear for about a second every half hour to hour. Power amp and power supply both strong. Panel, Face panel with dial window less most push buttons (excellent condition)- $65. Knobs / Caps / Buttons / Covers, Large Volume round knob - $35. Knobs / Caps / Buttons / Covers, Paddle knobs - $20. ea. Display, LED signal strength display assembly - $40. Potentiometers / controls, Volume Pot - $45. ea. Potentiometers / controls, Presence Pot - $35. ea. Potentiometers / controls, Balance Pot - $35. ea. Potentiometers / controls, Loudness Pots - $35. ea. Switch / Selector, Any "remote" cabled Switch / Selector linkage assembly (ie: Rec Out, Phono cartridge selector, or speaker Switch / Selector linkage) (not including the actual PC mounted Switch / Selector - $35. ea. Switch / Selector, Any remotely cabled / controlled, PC mounted Switch / Selector (less cable / control assemblies) - $35. ea. Switch / Selector, Momentary push Switch / Selector - $18 ea. Relay, JC2AD / 24 Volt DC Surge / speaker / output protection Relay - $25. ea. Transformer, Power supply Transformer (GA6460 100M008) - $65. Capacitors, Power supply Electrolytic capacitors 50v / 6800 uF - Radial Lead - $15. ea. Circuit Board, Power supply circuit board LC72360 with RB60 Bridge rectifiers (less electrolytic / filter caps) - $45. Circuit Board, Circuit board NA07668 (less power packs, relay, Jacks / Terminals / Connectors, pots and Switch / Selector. ??? Circuit Board, Tuner Circuit board LC-72240 with Yamaha IG-03210 IC (less Jacks / Terminals / Connectors, Switch / Selector & pots) - $65. Circuit Board, Input selector Circuit board LC72290-2 with all Switch / Selector and LED's attached - $55. Circuit Board, Station / tuner readout circuit board, LC72320-1 with fluorescent display tube and LC7207 IC chip (no battery included) - $55. Jacks / Terminals / Connectors, Speaker output connectors / Jacks / Terminals / Connectors - $45 entire bank. Jacks / Terminals / Connectors, Headphone jack / Jacks / Terminals / Connectors on circuit board LC72320-6 - $35. complete. Jacks / Terminals / Connectors, Any rear panel single component (ie, RCA banks, Antenna Jacks / Terminals / Connectors, etc, but not including speaker jack / output bank) - $25. ea. AM Antenna mounting clip - $20. Panel, Bottom Plate w/ feet - $25. Unit worked great, but in cleaning some of the push / rotating Selector with "TechSpray" brand, "Contact Cleaner, Third Generation", the internals of the Switch / Selector melted / froze up. Could have fixed with our other parts unit, but too many other 'fires' around here to tend to. Power amp and power supply both strong. Relay, JC2AD / 24 Volt DC Surge / speaker / output protection Relay - $25 ea. Capacitors, Power supply Electrolytic capacitors 50v / 6800 uF - Radial Lead - $15 ea. Circuit Board, Any single circuit board (less pots, Switch / Selector, large transformers, filter caps, outputs) - $40. ea. Jacks / Terminals / Connectors, Speaker output connectors / Jacks / Terminals / Connectors - $45. entire bank. Jacks / Terminals / Connectors, Headphone jack / Jacks / Terminals / Connectors on circuit board LC72320-6 - $35 complete. Panel, Rear panel less all components - $35. Some parts MAY* also fit other Yamaha 'RX-V' series, but we have no definitive info on which models so do your research. Panel, Face panel w/ display window. 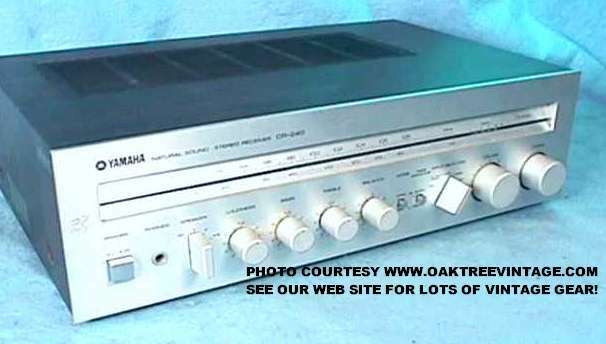 Decent cond with light, 1" scratch near bottom edge, between 'Speaker selector' and 'Tone Bypass' (less knobs / buttons) - $55. Knobs / Caps / Buttons / Covers, Round Bass, Treble, Tone, Balance knobs - $25. ea. Knobs / Caps / Buttons / Covers, Volume knob. - $35. Switch / Selector, 'TONE-BYPASS' 'Latched Push' Switch / Selector SW301 - $25. Potentiometer / Control pot, Motorized Volume Pot w/ LED, #?13M-100KAX5L25 Alps On circuit board XQ251-2 /CMKM-P3X w/ IC chips LC7535 and DIP's C4570HA - $55. Potentiometer / Controls, 'Balance' pot VR303 / 622M, 'center detent' 100K - $25. Potentiometer / Controls, Bass pot VR301 / 632M 20K - $25. ea. Potentiometer / Controls, 'Treble' pot VR302 / 613M 25K - $25. ea. Relays, OMRON Relay Type G5P-1 / 12VDC / 5A/250VAC/30VDC, 2826W4 (schematic part number RY503) - $35. Relays, DEC Relay Type DH2TU / 24VDC / 3A / 120VAC (schematic part number RY501) - $35. Circuit Board, 'Tone Control' Circuit board On circuit board XQ251-5 /CMKM-P3X w/ IC chips / DIP's C4570HA (less controls, pots, Switch / Selector) - $35. Circuit Board, Main Front Panel circuit board XQ252 /CMKM-P3X / VS941w/ IC chips / DIP's C4570HA (with 'tact' / momentary push Switch / Selector, fluorescent display and LSIC XQ329BO / 6433723DO6F ) (plastic button over lay / front panel sold separately) - $65. Circuit Board, Main 'Audio / DSP' circuit board XQ251 / CMKM-P3X / VS94180 w/ IC, and LSIC chips / DIP's; BU2090, C4570HA, LC78213, Toshiba TC51832ASPL-10, TC9273N-004, and Yamaha YSS223-K and voltage regulator AN78N05 (RCA I/O Jacks / Terminals / Connectors sold separately) - $65. Circuit Board, 'Power Amplifier / Driver' circuit board XQ049-4 / CMKM-P3X / VS710 original / OEM Transistors A1708, 2SC2240, 2SD1915, bridge rectifier D3SBA20, Elna capacitors 35V / 3300uf / & 2200uf, 0.1 Ohm resistors, and more (Output original / OEM Transistors sold separately) - $65. Circuit Board, 'Headphone / Speaker Selector' Circuit board XQ049-3 /CMKM-P3X (headphone jack and speaker selector Switch / Selector sold separately) - $25. Circuit Board, Tuning Circuit board XN593 / VR34 / 'AM / FM'. Includes antenna Jacks / Terminals / Connectors / ports. IC Chips; LA3401, LA1266, LM7000M, original / OEM Transistors 2SC1815, 2SC535 - $45. Circuit Board, 'Primary power supply' Circuit board XQ049-1 /CMKM-P3X w/ dual emitter resistors S1NB bridge rectifier original / OEM Transistors 3330, 2SA893, 2SA970, 2SA1358, 2SC1890, 2SC2229, 2SC3421, 2SD1915, Bridge rectifier D5SB, and more (filter capacitors sold separately) - $65. Circuit Board, 'Relay' Circuit board XQ049-2 /CMKM-P3X w/ original / OEM Transistors 2SA1015, 2SC2240, 2SD400, and more (DEC relay sold separately) - $35. Transformer / Circuit Boards, 'secondary power supply' Circuit board / transformer XC083 / TKP0198-31 (schematic part number T501) On circuit board XQ049-6 /CMKM-P3X w/ S1NB bridge rectifier (AC Jacks / Terminals / Connectors and Relay sold separately) - $45. Transformer, Power supply Transformer XQ253 / TKP0279-58 / A-1K / BB98009KC w/ fuse-circuit board (circuit board will need to be removed for shipment) - $75. Capacitors, Power supply filter Caps 63V / 10,000uf (ELNA 'For Audio' Audio Grade capacitors) - $30 ea. Transistors / Outputs, SK 2SA1726, 2SC4512, SK 2SC4495, (likely non-original) - $15. ea. Transistors / Outputs, SK 2SC3856, SK 2SA1492, 2SA1695, 2SC3856, 2SC4468 (likely non-original) - $18. ea. Jacks / Terminals / Connectors, Front mounted 'Video / AUX', RCA / 'S-Video' Input / Output Jacks / Terminals / Connectors (banks of 3)on circuit board XQ251-4 w/ plastic bezel - $35. Jacks / Terminals / Connectors, 'Video', Yellow RCA / 'S-Video' Input / Output Jacks / Terminals / Connectors (bank of 9)on circuit board XQ251-3 - $45. Jacks / Terminals / Connectors, Headphone Jack - $25. ea. Jacks / Terminals / Connectors, AC Convenience Outlets set of 2 - $20. Power cord / cable / mains lead, Original AC cord (plugs into circuit board) - $20. Panel, �Bay door�, Plastic �Deck A� - $25. Knobs / Caps / Buttons / Covers, �DOLBY�, �Record� level caps - $20. ea. Switch / Selector, �Dolby� control Switch / Selector (less cap) - $25. Potentiometer / Control, �Record level�, Right / Left - $30, ea. Circuit Board, �Main� Circuit Board #NA09033, Includes transistors; 2SA934, 2SA970, 2SA1310, 2SC1312, 2SC2060, 2SC3312, Mitsubishi 2SD1302, Horizontal package Mitsubishi AN6551, BA6229, LA3161, LCBU4001B, LC7800, LM64020, Mitsubishi AN90B20, TEA0665, with the balance of resistors, capacitors and mounted potentiometers, (less DOLBY and Recording level pots) - $60. Circuit Board, �Switch / Selector� PCB / �Display� XA746-2, includes 16 Green and Red LED�s, �momentary� push Switch / Selector, transistors; Horizontal package LC BA6124- $40. Circuit Board, �Power� XA856-NA090, with voltage regulators; Mitsubishi 2SD1273 , 2SAN791, fuse holders (2), and balance of resistors and capacitors, (less power supply) - $40. Power supply, XA775 TKP0205-A42 - $40. Jacks / Terminals / Connectors, RCA �Line in / Line out� connectors / Jacks / Terminals / Connectors (separate from PCB) - $ 25. Panel, �Rear�, sheet metal. (less connectors, outlets) - $20. Unless specifically noted, we do not typically sell 'component level' parts such as resistors, diodes, Transistors, semiconductors, ic's / integrated circuit chips, ceramic capacitors, led's, bulbs, lamps, belts, etc. We do commonly sell circuit boards / cards which will likely come with those parts attached. *When we say "some parts "MAY" also fit", that does NOT mean ALL the parts listed 'WILL' fit, and unless we show specific info that a particular part DOES 'cross-pollinate', do not infer that it does or will fit. Only careful research and comparisons, on YOUR part with service manuals, service bulletins, other comparable units, etc., MAY indicate a POSSIBLE substitution. If your situation is 'critical', do not base your decision on information found on this or any other page of this web site and do your own research. Before calling, PLEASE read the text in below. B) The part that you have found is NOT marked as SOLD or SOLD OUT. nor do we know who might have it. Sorry, but phone and email traffic for parts we don't have listed or for parts that are already marked "SOLD" has become too consuming of time resources. We try to keep these pages 99+% updated. If you don't see the part you are looking for, simply check the web page periodically as we never know what will show up each day. Thanks!!!!! ALSO: When e-mailing be sure to include a relevant subject, ie: Brand / Model number / reason for inquiry in the 'SUBJECT LINE'. "Hello", "Hi", "parts", "stereo", "inquiry", "question", "selling" or similar or similar 'un-qualified' terms may automatically be deleted by Anti-Virus / Spam settings or receive 'Low Priority'. (Subject lines left empty show up as "No Subject" and are deleted automatically by our anti-spam settings"
Before ordering by postal mail, please phone or email us about the item and the details of sending your funds. Thank-you. As much of the price charged for parts is for the 'time to extract' from it's donor unit, unless we send the 'wrong part', parts are NOT returnable. and changes may not be posted to web immediately. Information such as Parts Substitution possibilities, "Circa" dates, original values, etc. are to the best of our knowledge. If you are critically concerned, you should do independent research on your own prior to ordering or utilizing this information in any way. Manufacturers also are known to change part numbers, specs, circuit designs, specs etc within the same model.